The story we’ve been posting is about a boy raising birds. 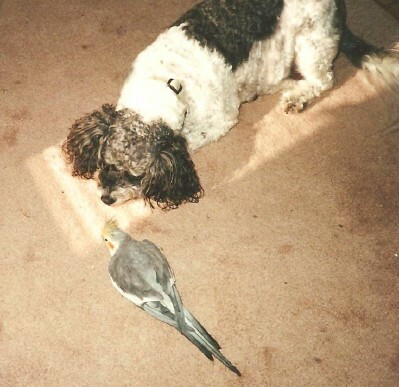 Just so that you know I have had some experience raising a bird in the past, Gayle is posting a photo I took around 2000 of my late poodle, Peppy, playing with my bird, Jimmy, whom I gave to friends with children when we moved away. Now you see where I got the name for my wingless budgie in the story “Jake, Little Jimmy and Big Louie.” Unlike the budgie in my story, my Jimmy had wings, was bigger than Little Jimmy and, as you can see, he was a cockatiel rather than a budgie. He did a lot of things that Jimmy the budgie learned to do. For instance, he loved to sit on my shoulder and he did learn to “talk” after I repeated words to him over and over. He also learned to whistle, as I was always whistling around the house at that time. Finally, we have another chapter of my children’s chapter book to post. We’d love to get some feedback from anyone who has read the beginning four chapters of this book, especially feedback from children who have read it or had it read to them. All you need to do is post a comment at the end of this posting. In this chapter, Jake runs into a bit of trouble as you can see by the chapter’s title. Spring break was soon over. As the weeks went by, Jake hurried straight home from school each day, immediately heading for his bedroom. Every day, as he opened the door very slowly (in case Jimmy was close to it), he would say, “Hi Jake, hi Jake, hi Jake,” so that, hopefully, Jimmy would hear and copy it. Well—Jake couldn’t have been happier. This little bird of his was certainly the best little budgie in the whole world! “Hey! Who needs a dog or a rabbit? Not me!” he laughingly told his little pet. One day his parents came home from shopping with a small travel cage for Jimmy. They had seen it at a flea market and thought that it may be useful if Jake ever wanted to take Jimmy to the vet or out to the back yard. Jake agreed that it was great and would come in handy. Then Jake got braver, or maybe sillier, judging by what happened next. When his best pals, Brien, Eugene, and Eugene’s one-year-younger sister, Tiffany, came over, the four of them would head to the park with Jimmy in his travel cage. They would sit in a little circle on the grass with Jimmy’s small cage in the middle. Jake would open the cage door, allowing Jimmy to come out and hop about the area among them. Their usual spot was close enough to the pond to watch the ducks, but far enough away from the water so that Jimmy was in no danger. They did this quite often when the weather was nice and they all agreed that Jimmy enjoyed it as much as they did! As their heads turned in the direction of the voice, they saw a boy, not much older than they were, running along the path at the edge of the pond and almost in their direction, clutching a lady’s handbag. “C’mon, you three. Let’s get that guy.” Brien shouted as the thief ran past them. With that, the four of them jumped to their feet. There wasn’t enough time to put Jimmy into his cage, so Jake scooped him up and tucked him into his jacket pocket. They then started racing as fast as they could after the thief. Twisting around bushes, trees and flowerbeds while running over a large section of the park, Jake gradually outdistanced his friends because of his longer legs. He was quite a bit in front when suddenly the thief, who knew that he was soon going to get caught, threw away the purse. Jake didn’t let up. He was just a very short distance behind the thief when the boy suddenly turned on him, putting his fists up, ready for a fight. Two seconds before they were about to clash, Jake quickly bent over and with his head lowered, rammed the thief in the middle of his chest. The thief was taken by surprise; all the wind was knocked out of him. They both fell to the ground, wrestling as they rolled around. The next thing Jake knew was that Tiffany had joined the scuffle, grabbing hold of the thief’s hair. Battling the pair, the thief didn’t have much strength to fight after Jake had plowed into him. This made it easy for Jake and Tiffany to hold him down until Jake’s two other friends and two nearby adults arrived on the scene. Since the trio had finished off their skirmish by rolling into one of the flowerbeds, Jake and Tiffany’s clothes were very dirty. Getting to his feet and, beginning to clean himself off, he suddenly thought, ‘Jimmy’. In all the excitement, Jake had forgotten all about his little pet. His hand flashed to his jacket pocket. It was empty! Jake panicked, his heart missing a beat and tears filling his eyes. He’d lost his best friend! Had Jimmy been crushed when Jake was rolling on the ground? Was he close by or nearer to where they’d started running? Where could Jimmy be? Was he still alive? Had some passerby stepped on him? All of these questions raced through Jake’s mind, making him fear the worst. They had covered a lot of ground, running here and there and around bushes as they chased the thief. Jimmy could have fallen out anywhere in between. Not only was Jimmy tiny; he was also mostly green—a perfect camouflage, making it very difficult to see him in the grass! “Hey guys, I’ve lost my Jimmy.” Jake called out. He found it hard to talk, to tell them to be careful where they stepped in case they would hurt him. They had covered a lot of ground and Jake knew it would be very difficult to retrace their actual route. During the search, Tiffany approached a group of boys and girls about their own age who were playing in the area, and asked them to help look for the little bird. She explained what Jimmy looked like and with the extra help, Jake felt a bit better. The five extra pairs of eyes could make a difference and the more people that were looking for Jimmy, the more confident Jake became that they would soon find him. “Jimmy, where are you?” Jake called out continuously. He had a strange lump in his throat and felt so terrible to have lost his little friend that he could scarcely get out the words. It was more than an hour later and they were almost back to where they had started the chase and still there was no sign of Jimmy. When they reached the spot, Jake got another shock; Jimmy’s cage was gone! They found some more kids nearby who also joined the search. There were now fourteen young people searching everywhere for Jimmy and not a trace of him could be found. They looked again and again all over the area where they had chased the thief, but eventually had to give up because it was beginning to get dark. After they visited the police station and wrote out a report, Jake felt better, hoping it would do some good. A week later, Jake’s dad walked out the back door with a great big smile on his face. He was grinning widely as he approached Jake, Brien and Tiffany, who were playing in the back yard. “Big news, guys, what do you think? There’s been a call from a man who knows someone who has just become the owner of a budgie in a little cage. It seems like the ad in the paper has paid off.” This, of course, caused the three to jump up in the air with glee and hug each other. Mr. Moore then called the police to report the phone number of the person who had called him. The police sergeant at the desk had informed Jake’s dad that they would investigate and get back to him as soon as they found out anything. Three boys and one girl sitting on the grass in a circle, with Jimmy in his travel cage in the middle of the circle. Jake chasing the thief, who is holding a lady’s purse. Jake wrestling with the thief. This entry was posted in Biographical info, Blogging a book, Children's chapter book, Writing and tagged birds, budgie, chasing a thief, children, family, pets, raising birds, stolen pet. Bookmark the permalink. ← Happy Hogmanay! Happy New Year! Thanks for your kudos and feedback, Francis. We appreciate your taking the time to give some interesting suggestions. Regarding looking at Jake’s comments from the view of an 11-year-old boy, we have already thought of that and have invited our 11-year-old great-grandson, Leland, to be a consultant on the book. We hope to have his feedback before the book goes to print. We’ve told him to consider all of Jake’s statements and let us know if they sound like something an 11-year-old boy would say or if he finds some of the statements corny, out-of-date or in need to adjusting. We hope he’ll have some good suggestions. Interesting that you should have picked up on the “Christian spin”, as you call it. Those were not in the story when Ian first wrote it. I (Gayle) am the strong and active Christian influence in the family and, when I first read Ian’s story, I was working as editor for a women’s Christian organization. My writing usually has a Christian slant to it, since that is how I am, feel and think. I also very much appreciate reading a book that portrays Christian views in an ordinary lifestyle setting. I had the idea of pitching the story to several Christian publishing houses so suggested places where Ian could add that content. He agreed to do so and then the story went through another heavy edit by me, resulting in what you are reading now. The publishers we sent the book to did not pick it up, so we have decided to self-publish it as we have Ian’s other books. Ian and I will be considering your comments as the story progresses to its final edit. Hi Gayle and Ian – this morning has been my first chance to really dive into Jake, Little Jimmy and Big Louie. I’ve really enjoyed Chapters one through four – there is a great flow from one chapter to the next. My granddaughters are a bit young for a story of this length but I have an eight year-old neice who would love it! I received a biography of W.O. Mitchell for Christmas and that had me thinking of the challenges of writing from a young person’s point of view. Mitchell’s success with Who Has Seen the Wind certainly points out how to do it like a master. In terms of feedback, I’ll make a comment and a suggestion. First the suggestion – sift each and every single thing Jake thinks or says through a careful sieve – asking yourself all the time – would an eleven year old kid think this, would an eleven year old kid say this. I’ve been reading a few novels lately in the genre of young adult fiction and I am often disconcerted to read things coming out of the mouths of teenagers that I believe are thinly veiled attempts by adults to moralize to kids – I don’t believe that is what reading should be – and don’t get me wrong – I’m not saying you are doing that. Just something to be on guard about. Now for my comment – you obviously come from a Christian background and are comfortable with mentioning God in your story and putting a Christian spin on events. No doubt that perspective suits yourselves and your family, which is great. I think you are writing a powerful children’s novel here – in order to give it a larger audience would you consider dropping such references? Are they really integral to the story? Just something to think about – I know other adults who would shy away from reading a book with such obvious Christian attitudes to their kids because that either isn’t their own family belief system or they do not have a religious practice in their family – for any number of reasons.